Very sturdy piece of furniture. It took two of us to put together in about an hour and 30 minutes. So far very pleased! Select this dependable bed for its simple style and distinctive versatility. This steel-framed platform bed features a fold-up design, allowing you to tuck it away when it's not in use. 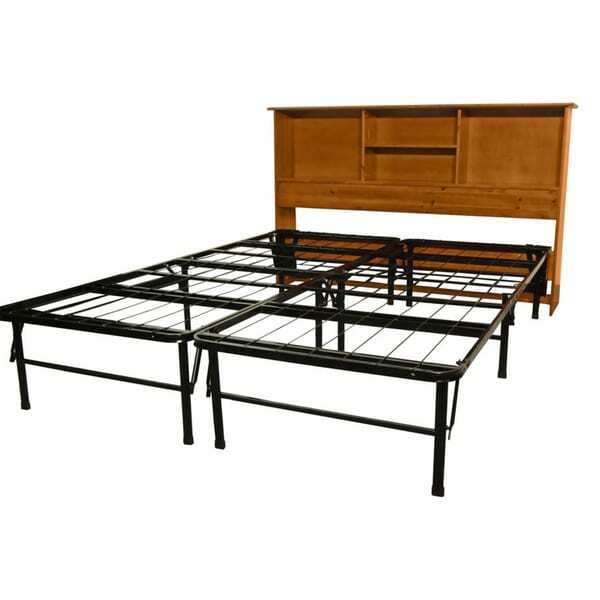 The foldable steel-frame does not compromise the dependability of the bed. Constructed with electronic welding technology, the bed is designed to stand up to regular use. A wood-toned headboard graces the top of this bed, adding to the aesthetic appeal and functionality of the piece. Select from an assortment of finishes, including black and medium oak, to choose one that complements your existing wood tones. Along with providing an additional decorative element, this headboard can add extra storage to a small space. The bed was easy to setup until we got to the bookcase headboard. All the pegs have to line up with the pre-drilled holes that aren't perfectly matched to the pegs, so fitting them together caused a long crack. It took about 5 hours for one person start to finish, mainly trying not to break it while getting the pegs into the pre-drilled holes. It's a pain to return, so will have to super glue the crack. Disappointing assembly. Serious manufacturing defects make assembly almost impossible. Absolutely the worst 'do it your self furniture' I have ever purchased. Bed frame does NOT attach to head board without using electric drill. 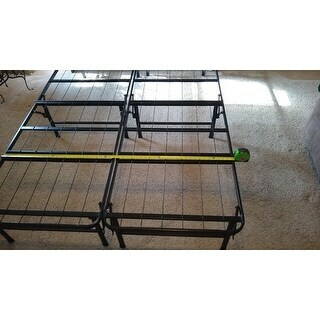 Frame measures only 52 inches leaving it short of 54 inches for a standard full size mattress. Durabed is a sham . As received it was impossible to assemble without trips to hardware store. Manufacturer hopes you will not return the 200 pounds of junk that was delivered because it is too hard to get back in the box. Keep the packaging material, assemble the frame and see if it measures as advertised .Then your troubles really start on the headboard assembly. Is this sort of frame for something you don't intend on moving. Probably not. This frame does its job very well. Great for if you move a lot, or even a guest bedroom. It has plenty of under the bed storage space. Maybe because the headboard parts are made in China, the instructions were not easy to follow, and some of the holes were not drilled straight making the assembly even more difficult. I will never buy another bookcase headboard that needs assembly. The frame is wonderful and went together with no problem and is very sturdy. Now that the bed is together finally, it looks very nice in my room. This came with the most horrible directions I have ever seen! That is my only complaint .... Just set aside some time and /or have help ! Bought for my teenage son. He put it together himself with no issues. Very sturdy and has storage space underneath. I put it together myself, imaging on instructions could have been better, much better, but, I figured it out myself. "can I purchase just the frame, no headboard? z"
"What is the maximum weight limit of this bed and hold"
"Hi There! I am needing to know the measurement of the space between the frame & floor please. My son stores his large farm equipment toys under his bed currently, and would need at least 12 inches of clearance to purchase this item!" "How long is the bed from headboard to end of frame?" "Woud this bed frame fit well with the Slumber Solutions 12-inch Full-size Gel Memory Foam Mattress?" In my opinion, this item would not fit a 12 inch mattress properly. The headboard may be covered more than desired. "Hi. I purchased this for my son. 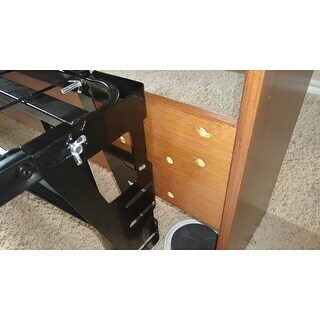 It came with NO Screws and only 1 bracket to attach the headboard. I would expect at least 2 brackets. Can you tell me what was supposed to be included in the headboard and frame cartons?" Please contact customer care for further assistance U.S. and Canada Toll free: 1-800-The-BIG-O (1-800-843-2446). "It says that this is available in Medium Oak finish, but does not list that as an option on the drop down menu?" Hello Laurel K., unfortunately that item is currently out of stock. Thanks for shopping with us!